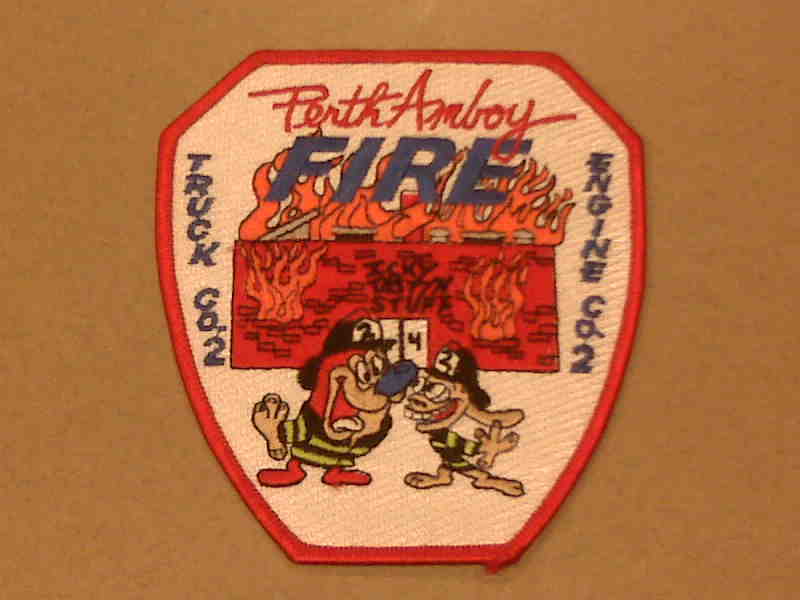 This morning I woke up in Perth Amboy, New Jersey at the firehouse. My goal was to get over the bridge into Staten Island, find a place where the supply van could be parked, and start to form a plan to get into New York City within a few days. I hadn't figured that when firefighters get involved things happen fast. The men at Perth Amboy reached out to Staten Island and gave me a map and instructions to get to the Rescue #5. 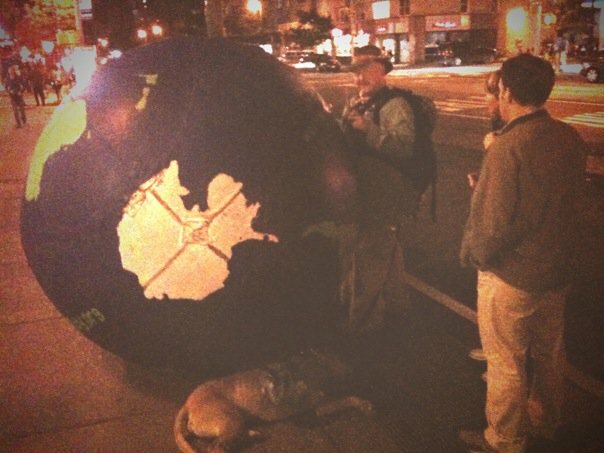 Once there, after explaining that I was walking through all the New England states for the cause of diabetics around the world with my dog (Nice) and wanted to walk in New York City. They advised me that Sunday morning was the best day to get into the city. They reached out to Engine Company #4 - Ladder Company #14 and were able to get me a place to park. They gave me instructions to get there and we were off to the Big Apple. 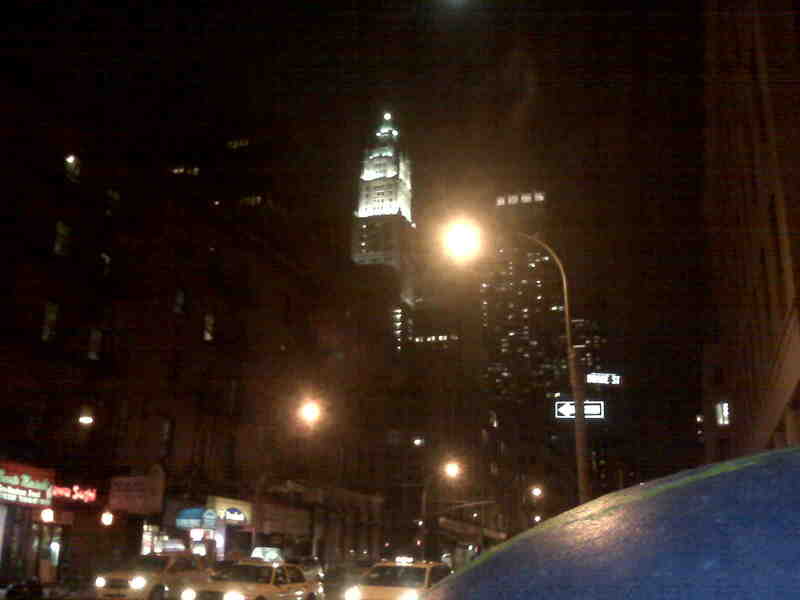 I drove over the bridge (and of course took a wrong turn) and soon found myself lost in the city. 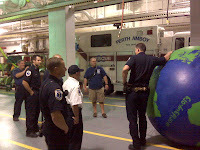 I called over to Rescue 5, and like their name, they guided me by phone to the waterfront firehouse. Firemen go beyond and above the call of duty: they rescued me from being hopelessly lost in the big city. The parking is limited for the firemen at Ladder 14 and permission to park there granted over the phone needed clarifying when I got there was needed, and they allowed me to stay. 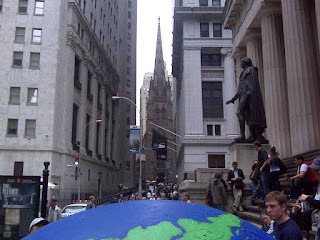 We were a block away from Wall Street. Walking on country roads with a six-foot canvas facsimile of the earth is worlds away from the bustling throngs of even the small crowds of Sunday in New York City. 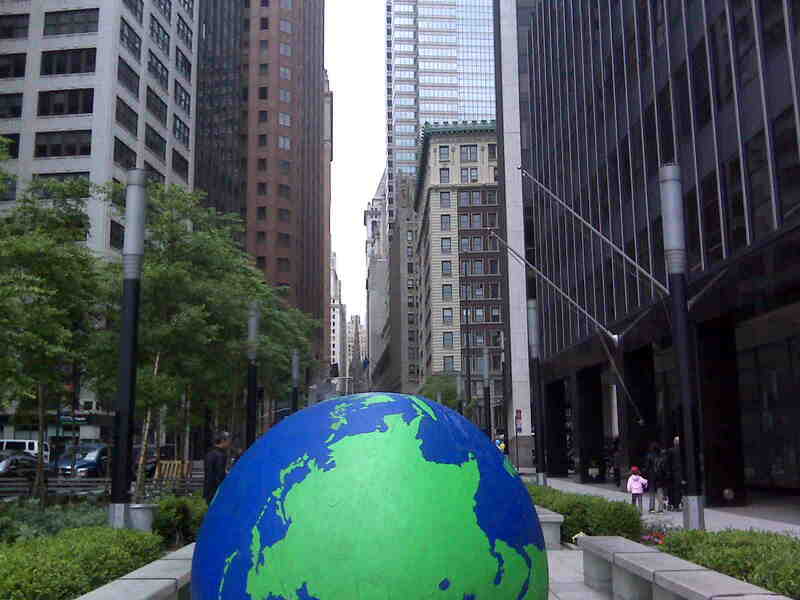 I inflated the World, loaded our packs, and rolled for Times Square from Wall Street, heading up Broadway. As we approached Broadway, a reporter came and did an interview for a newspaper, took our picture, and we were on our way again. We had only been a few blocks and had our picture taken by hundreds of people and had stopped to tell our tale several times. The first man who had stopped us was a diabetic himself. I thought either this was a coincidence or diabetes is so prevalent it really is epidemic. My journey to New York City will have been a success because that man said he would work harder to control his condition. His friend was standing with him and assured him she would help also. Support from others is so helpful in anything we do. The sidewalks were wide enough for the World and the Sunday crowds. I could quickly read the difference between tourists and those who live here. All gave us room to pass; even the most sour faces softened and fought back a smile as the World rolled by. We crossed from side to side as the scaffolds and street vendors sometimes left no space for our World. The people were very hospitable to the world and stepped aside. While we slowly rolled along I heard an almost constant murmur of "worldguy.org" and the click of phones and cameras. I thought of this blog and my writings on it. I thought of how I don't like how I look in a photograph. I told myself that I chose this for the message of being active and fit by any means, to raise awareness for diabetes control and prevention. My self criticism and vanity only holds me back from that end. I pushed on to Times Square. When I arrived to the Square, I skirted by the heaviest of the crowds and then to Rockefeller Center where I sat at one of the benches there. 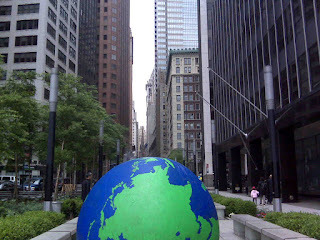 I was having a conversation with a young couple, people were standing by the world taking pictures, and all was well with the World when a man from the center came to tell me I needed to move on lest someone trip over the World and they were sued. I am not sure how someone can trip over a six foot earth ball (although I do have a string attached to it.) So, I moved along. Earlier in the day I had asked a police officer where I might be able to safely sit out the evening so that in the morning I could be one of the waving tourists waving to the camera on the morning news shows. The officer said Times Square is safe and people are there all night. They have strong presence there for security. It took me six hours to walk to Times Square, and there was no way I could get back to the van to rest and return by morning. Then came the pinprick. An officer rolled up to tell me I couldn't be standing around the Center or the Square because, with all the scares going on, I may be disguising an explosive device inside this 6-foot round inflated World. So, I had to move along. I still believe all events have a silver lining, and while I walked the five hours back down Sixth Avenue as the shops loaded their mountains of trash on the sidewalks for the night crews to pick up, that it would be better not to walk the streets on Monday when all the office workers are rushing to and fro' while the tourists around the world are clicking pictures of the man with the Indiana Jones hat pushing his giant rolling stone from the Temple of Doom. Yes, while I walk I do have too much time to think between the photographs and conversations. When I got back to Wall Street and Broadway in the evening, I met a man who had just left his office and was very interested in my quest. He said he had many media interests and took my information down and wanted to help... A chance meeting at almost midnight on the empty streets in the hub of the World. Today, I give thanks to the concerned policemen who was protecting the masses of the world from the World for being the latest silver lining.